Last week, my toddler woke up cranky. I carried him to the car crying. As I strapped him into his carseat, he straightened his body like a board….this made things very difficult. How can such a little body be so strong? After parking, I carried him up the hill to my daughter’s school crying. He cried all the way back to the car and, again, refused to get into his car seat. Eventually, I got him strapped in. I turned on some Dora the Explorer songs and somewhere between “The Wheels on the Bus” and “BINGO,” he stopped crying. However, I was exhausted. When I got home, I ate a cupcake….a big one with strawberry frosting….because after that episode, I felt like I deserved it (First World Problems, I know). 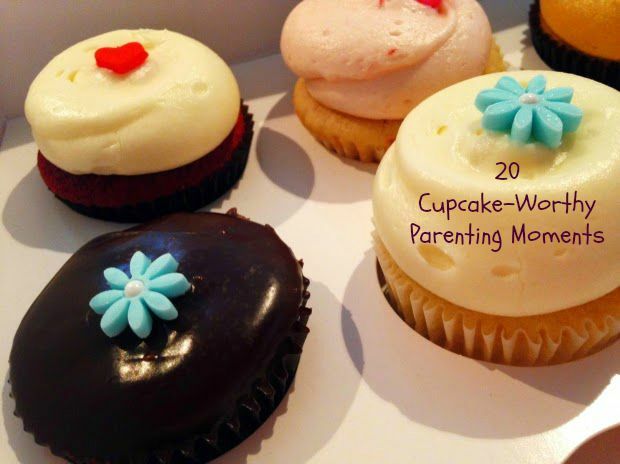 Here are a 20 other cupcake worthy parenting moments. Your daughter uses half of your expensive wrinkle cream for a science experiment. Your toddler grabs a bag of powdered sugar and dumps it on the ground. Your oldest gives your youngest a hair cut. You get a call from the principal…. Your child draws his/her self portrait….in non-washable crayon...on your newly painted walls. The doorbell rings. It’s your teen, and a police officer. You hear Uh Oh I _____________________ (fill in the blank). Mommy/Daddy, I flushed a _______ down the toilet. Your children are fighting over a toy. There’s a lot of hair pulling and maybe even some biting going on. Your toddler throws an epic tantrum…..in aisle 7 of the grocery store…..people are staring. Your baby has not one, but two, diaper blowouts at the park. You only brought one diaper and it’s a long walk home. Your toddler runs down the hallway, throws a giant paper towel wad down the toilet and flushes it. You frantically grab the plunger as the water starts overflowing onto the floor. Your son/daughter accidentally spills water all over your brand new MacBook Pro. Your baby woke up every hour on the hour last night. You hear giggling and realize your preschooler has gotten into your makeup bag. Your potty training toddler rips off his/her diaper and unleashes a giant, Niagara Falls pee on your carpet. You just got the baby down for a nap when the doorbell rings, your dogs start barking and your toddler decides now is a good time to press the car alarm button on your key ring….baby is now wide awake. Your tween informs you that he/she has a project due on September 25. It’s 6 o’clock on September 24. Your toddler screams the entire duration of your flight/ long car ride! You’re about to go out on a date! It’s been way too long. You bought a new dress and right before you’re about to leave your toddler runs over and wipes a combination of peanut butter and applesauce on you. You change into whatever is clean and make sure to order dessert at the restaurant. In my house, cupcake worthy moments are plentiful! (This is why I don’t keep a lot of sweets in the house). Chocolate Dipped Strawberries: A couple of these sweet fruits will help satisfy your sweet tooth. Dip them in dark chocolate for extra antioxidants. Kind Bars: I love Kind Bars. My favorite are the Dark Chocolate Nuts and Sea Salt. They only have 5 grams of sugar and plenty of protein. Grilled Pineapple Rings Drizzled with Honey: I take canned pineapple and drain the juice. Then, I drizzle them with a little honey and olive oil. I grill them on the barbecue for a few minutes on each side. What’s your most cupcake (or cookie, chocolate, ice cream) worthy moment of the week? Do you have any tips for a healthier way to satisfy your sweet tooth when you feel stressed? Melissa Matters © 2014-2015 All Rights Reserved. No images or text may be copied without consent from the author.